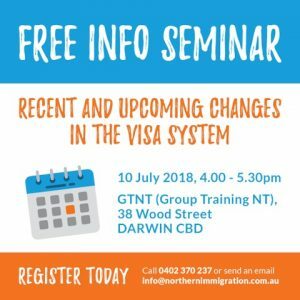 This FREE seminar will discuss Australian Immigration laws, as well as recent and upcoming changes in the Visa system introduced by the Department of Home Affairs. Understand what the changes mean for your future in Australia!! The seminar will be run by our Principal Migration Agent, Manuela Seiberth. Additionally, our guest speaker Kevin Wrigley from BUPA will talk about health insurance requirements. PLUS: Q&A session with your NT based Immigration Law Specialist! !